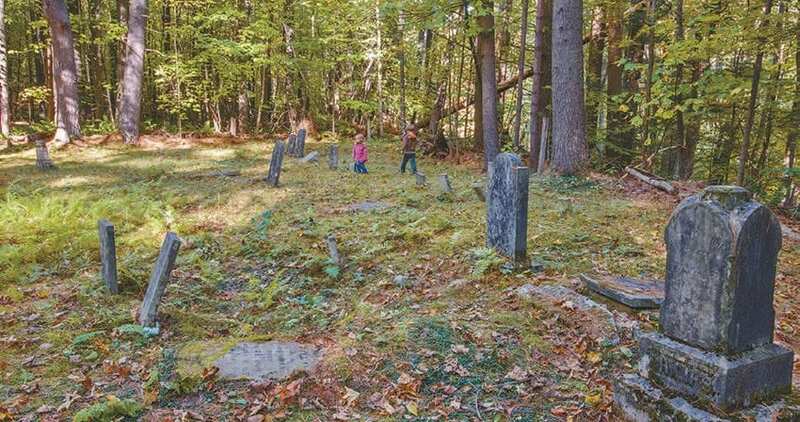 The largely abandoned Wardsboro Road near Lake George connects the present with the past. 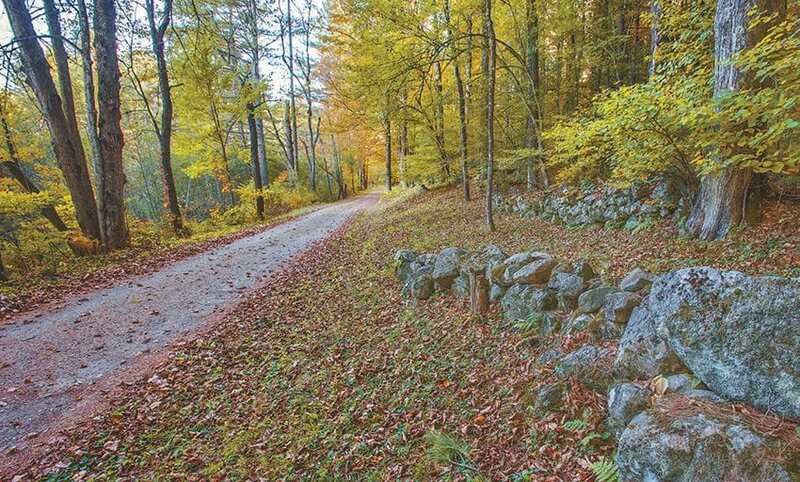 Wardsboro Road passes through woods where a community of farms once thrived. The midsection of Lake George, known as the Narrows, is so tightly squeezed with steep mountainsides that there are no highways along its shorelines; without such access, most of that stretch of lake is bordered by state land. Roads connecting the north and south basins of the lake have to run well back from the shore. The nineteenth-century throughway on the west side, called Wardsboro Road, was built several miles from the lake and had to climb and descend 1,300 feet to connect the towns of Bolton and Hague. The road is named for the early farming community at its southern end. 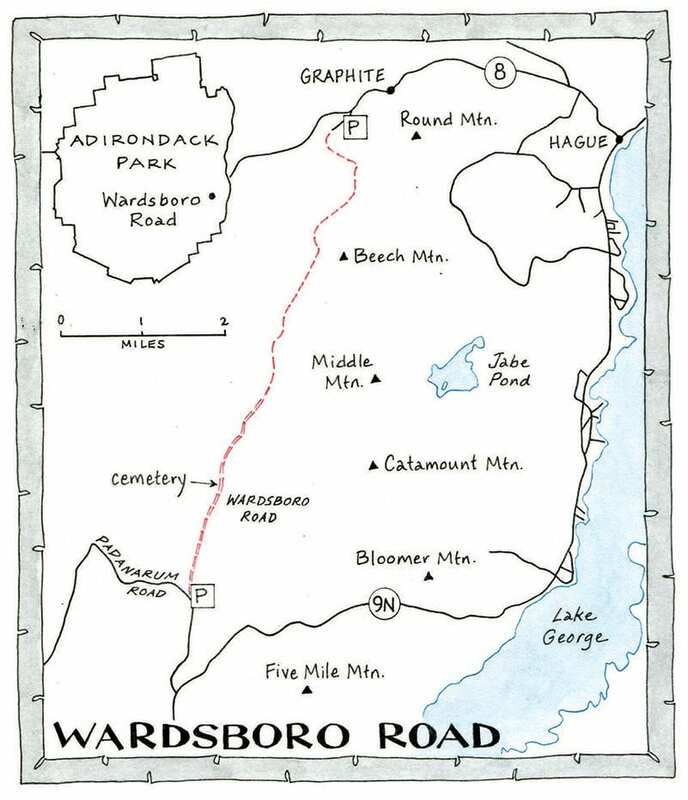 Most of the original Wardsboro Road is still open—to snowmobilers, skiers, snowshoers, hikers, mountain bikers, and horse riders (and cars and trucks for a mile or so at each end). Following the old right of way, it begins and ends on private land, passing through a lovely and varied stretch of Forest Preserve in the middle. Stone walls, cellar holes, and side roads testify to the long-gone communities linked by the road. 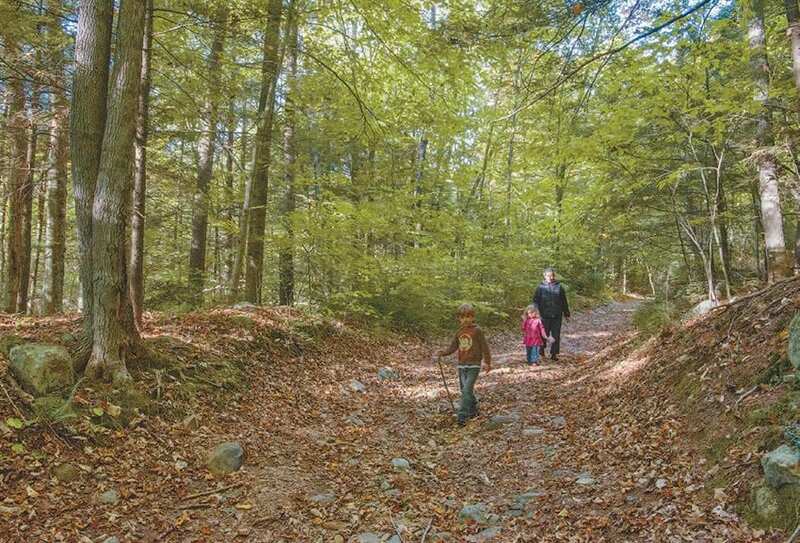 I had explored the route, in pieces, for work on the Adirondack Mountain Club’s Guide to Eastern Trails, but had never hiked its full length until this September. The decision to walk north to south, downhill, and then back up, was easy. To start at the south end of the seven-mile roadway would require an extra fifty miles of driving (given that I would be coming from the north). 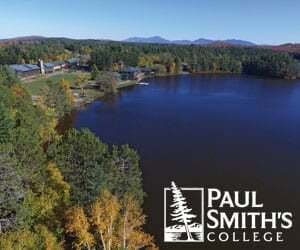 This is often the case in the Adirondacks, where parallel roads are few and far away. The northern trailhead is near the hamlet of Graphite, home to former mines for that mineral. I parked just off of Route 8 on Fly Brook Road, a rough but current town road on the shoulder of Graphite Mountain. The walk started on the level at 1,600 feet of elevation and then gradually rose about a hundred feet, past three logging roads. The noises of the highway faded, and those of the forest took over. The first of the day’s many startled grouse exploded away in a flurry of feathers. I passed through a brushy blackberry clearing at the high point of the hike, with a hunting camp just off to the right. The road narrowed to two tracks and entered a small pass. Occasional snowmobile signs marked the way, as a couple of smaller wooded roads took off on either side. The route was level. As I began to descend, a small stream gathered itself on the left, and I had to dodge red efts. These are the bright red-orange terrestrial phase of the amphibious eastern newt. Before and after this life stage, they are aquatic, homing in on waters with magnetic orientation. Their coloration is a toxicity warning to predators. The roadway became rockier and a bit washed out as it continued downhill. Rusty corrugated culverts, squashed and useless, attested to maintenance at least fifty years back. Solid stone walls guarded the right hillside. The grade eased off at about two miles, and the trail took a short swing around a wetland. Goldenrod was everywhere. 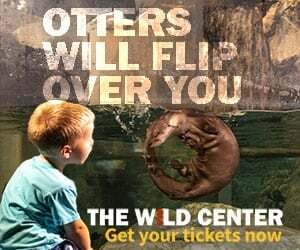 Much of the road is gentle enough for tenderfoots. The woods looked the same, but I was now in the Forest Preserve. A dried-out beaver pond was studded with gray stumps. The trail crossed the outlet and came to a fork on the left, where the original route climbed back along the shoulder of a small mountain before heading east down to Hague; that way is now blocked by active logging. My course continued level and south. With the stream and more wetland on the right, I moved on through half-open woods of maple, beech, and yellow birch, a classic northern hardwood forest. Some of these trees were gigantic. The roadway continued on down, at times gently and smoothly, and at others steeply with rocky bumps. Then came another bridge crossing and a long side-hill descent. Now, at just over four miles, stood a row of old cedar fence posts, signaling a small clearing and camp on private land. Tumbled stone walls wound uphill to the right, and the route continued downwards. This section was clearly maintained, but lightly so. Another long downhill gradually eased and brought me past more old side roads leading to cellar holes at the northern reaches of Wardsboro. The way was almost flat now and crossed a high stone-and-culvert bridge over the outlet of Spectacle Ponds. In the 1850s, the wetlands and flats on the floor of this fertile valley were home to twenty-three small farms. There were two schools and two sawmills, a thriving, hard-working community with ties to the larger Alma Farm to the east. Potatoes, lumber, and maple products were the basic crops here, sold throughout the lake basin, and a weekly stagecoach went through. Winters had to be severe, with the cold air draining from the heights on three sides. By the 1920s, most of Wardsboro had died out or packed up for the more competitive farmland of the Midwest. By the 1980s, most of the land had been sold to the state. This part of the road, now smooth sand and gravel and slightly rolling, is still open to vehicles, but it’s a back road off a back road. Traffic is practically non-existent, and I ambled along, past a few well-kept camps in sylvan clearings, huge white pines, stone walls, and fields of ferns. Northern flickers, which are medium-size woodpeckers, looped through the sugar maples and flashed off into the underbrush. This was a gorgeously tranquil setting. 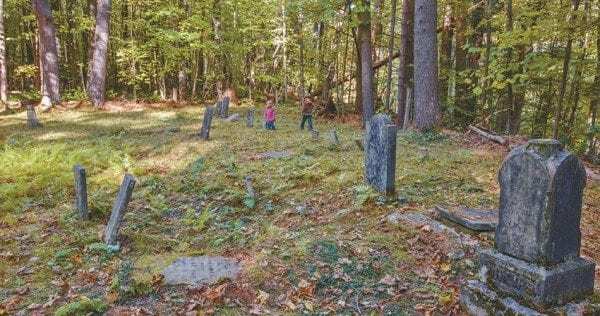 The last burial in the Wardsboro Cemetery occurred in 1909. The Wardsboro Cemetery sits on the east side of the road, at five and a half miles. Ferns carpet most of the ground between the thirty-two gravestones. Some are cracked and fallen; most are still upright and legible, even in dappled sunlight. The first burial took place in 1842, and the last, for Emma Clark, an infant, in 1909. Two young siblings’ inscription reads, “Death came like a wintry day. It cut my lovely flowers away.” The place is hauntingly peaceful. I ate my lunch, read most of the stones, and took some photos. My chosen approach, by chance, seemed the best way to visit Wardsboro. The hike down took about two full hours, which had acclimated me to the setting. A running visit by car might not feel so calm. I could have hiked a mile or more through magnificent pines to the southern end, but it was time to head back up the mountain. Return trips are often routine, distracted rushes back to the car, the scenery a blur. But once in a while, one sees new things, from new angles on the familiar. The uphill trek was sweaty work on a hot afternoon, so the brook water now looked inviting, and I dunked my shirt and kept cool most of the way. I spied some unusual fall berries: the striking pink, black, white, and toxic clusters of doll’s eyes, or white baneberry; and the scarlet seed of jack-in-the-pulpit. Oddly for September, a violet was in bloom. More grouse whirred off. In just under three hours, I was at the upper end. A short exploratory detour took me through recent logging slash, and my mind returned to the present day. Cliché though it sounds, the hike down to Wardsboro was a trip to the past, a serendipitous visit to an uncluttered place that tells a poignant story in a stunning and remote valley. I hope to go back. Northern trailhead: From the Brant Lake firehouse, drive east on NY 8. In about 10 miles, you pass North Pond on the right. About a mile past the pond, take a sharp right onto Fly Brook Road, a dirt road. Soon after making the turn, park on the right side of the road. Southern trailhead: From Northway (I-87) Exit 24, drive about 5 miles east on County 11 to NY 9N. Turn left and go north for about 6 miles to the dirt Padanarum Road on the left. Turn here and go 1.8 miles to a bridge, then turn right onto Wardsboro Road and park. You could turn left onto Wardsboro Road and drive 1.6 miles to the cemetery, but the road is rough.